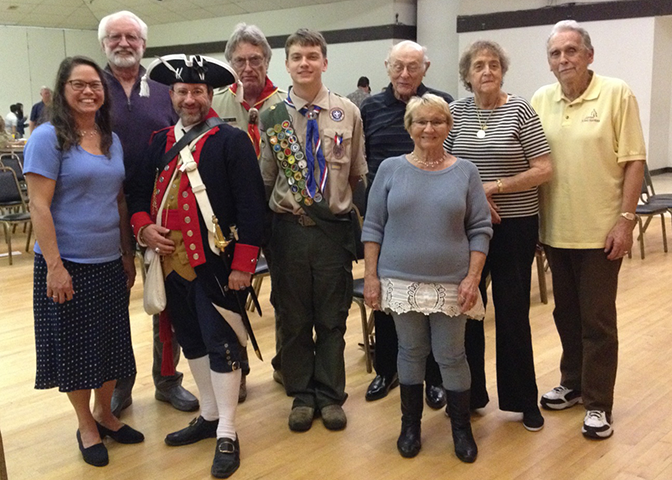 The Sacramento Chapter recognizes Eagle Scouts through "SAR Certificates of Recognition" at BSA Courts of Honor and also participates in the CASSAR and the NSSAR Eagle Scout Scholarship Program. For many years the SAR has recognized the many common bonds of purpose and principles shared by the SAR and the Boy Scouts of America. Young men achieving the rank of Eagle Scout have demonstrated their belief in these common principles. For this reason, the SAR believes that Eagle Scouts are deserving of special recognition for their dedication and accomplishment. There are two elements to this recognition. First, there is a recognition of all new Eagle Scouts. This does not depend on any later decision by the new Eagle Scout about whether to compete for the scholarships available, or not. It merely requires someone in the scout troop adult leadership to send a request for the SAR Eagle Scout Recognition Certificate. 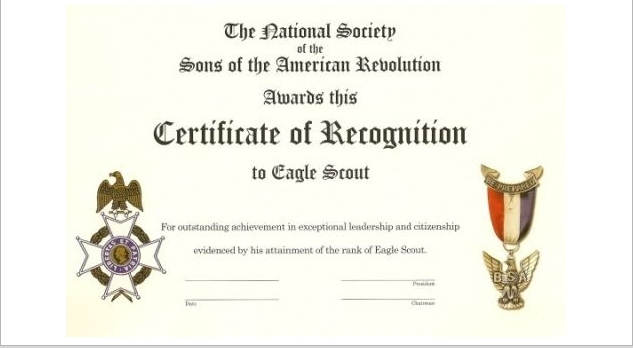 SAR Eagle Scout Recognition Certificate. The request should be made at least thirty (30) days prior to the date of the Court of Honor ceremony. Local VASSAR chapter (if known). Again, congratulations to you on attaining the Eagle Scout rank. We extend our best wishes for continued success in all your future endeavors.